For the second year in a row, Shock Till You Drop is excited to be co-sponsoring the horror culture component of the massive Niagara Falls Comic Con, located on the scenic Canadian side of Niagara Falls. And this year, they’ve got a slew of super guests. The Falls Horror Fest takes place inside Niagara Falls Comic Con from June 2-4, 2017, and features over 5,000 square feet of horror exhibitors, a replica of The Munsters Koach, The Walking Dead Zombie Photo Op Experience and Bill Diamond Productions (featuring screen used and replica props from Little Shop of Horrors, Dark Crystal, Labyrinth and more). 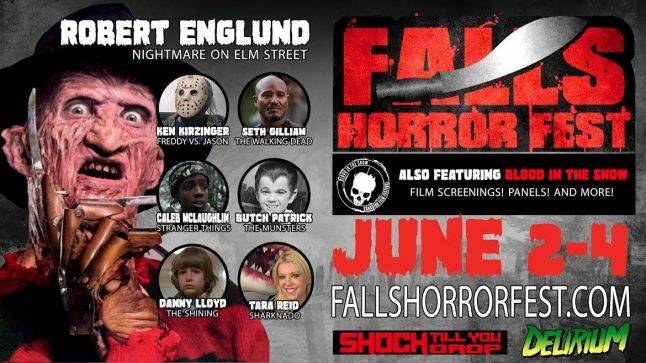 Celebrity guests include Robert Englund (A Nightmare on Elm Street), Amanda Wyss (A Nightmare on Elm Street), Brooke Bundy (A Nightmare on Elm Street 3 & 4), Ken Kirzinger (Freddy vs. Jason), Seth Gilliam (The Walking Dead), Tara Reid (Sharknado), Danny Lloyd (The Shining), Caleb McLaughlin (Stranger Things) and Butch Patrick (The Munsters). Shock writers will be hanging out at the panels and the official STYD booth and Canada’s premiere horror film festival Blood in the Snow will also be present, screening classic and contemporary Northern genre fare. For more on the Falls Horror Fest and to nab tickets go to the official site and check out the wild contest the fest is currently running too.